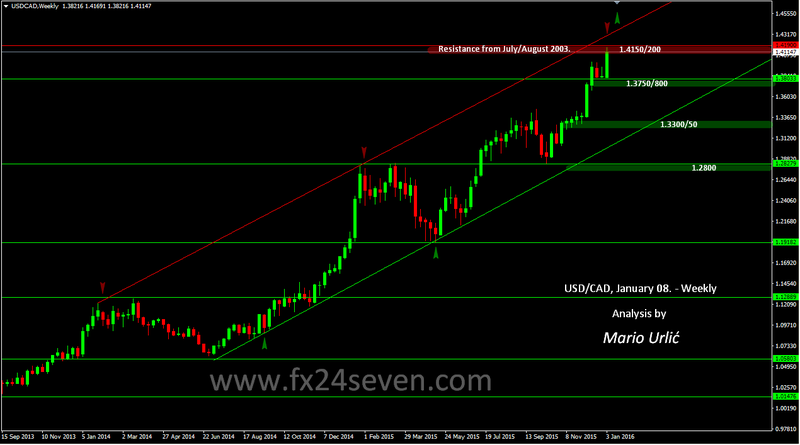 USD/CAD, great beginning of the year! Great week and beggining of the year for the USD/CAD. You can see in my analysis, how the pair is moving true the weekly up trend channel, but before the resistance line from inner side, it reached the resistance level at 1.4150/200, the previous resistance and level from July/August 2003. The pair opened the 2016. at the strong weekly support from December, at 1.3800 an it reached almost 1.4200 in this week, mostly on furder oil weakenes. The CAD robustly maintains the highest oil correlation in the forex market. If the US dollar manage to brake this resistance, trend line will be the next target for the buyers, after wich the 1.50 could be the next. But, for now, keep your focus on the resistance and weekly channel.